For centuries, dogs have been used to track scents. You’ve likely seen Lassie or witnessed police dogs or hunting dogs track a scent. Well, doctors at the University of Pennsylvania are now experimenting with new uses for a dog’s sensitive sense of smell—and exactly why might surprise you. To a human nose, cancer has no scent. The thought that cancer patients smell a certain way may seem absolutely absurd. But that could be the case for dogs; with their acute sense of smell, it’s possible that dogs can identify tissue that has the potential to kill. McBaine, one of four dogs trained to identify the scent of cancerous tissue at the Penn Vet Working Dog Center (part of the University of Pennsylvania’s School of Veterinary Medicine) is a springer spaniel. Through his sense of smell, McBaine can pick out a cancerous blood plasma sample—with confidence—out of a dozen vials of blood. Doctors hope to use the dog’s sense of smell to help them figure out which compounds found in cancerous tissue create odors, hoping to create technology—a “robotic nose,” of sorts—to use on humans to identify cancerous cells at the earliest possible stage, allowing for more effective treatment. Amazingly, the doctors expect these robotic noses will be able to detect cancerous tissue that is 1/100,000th the size of a piece of paper. Currently, a team of chemists and biologists is working to isolate scented compounds in cancer tissue. 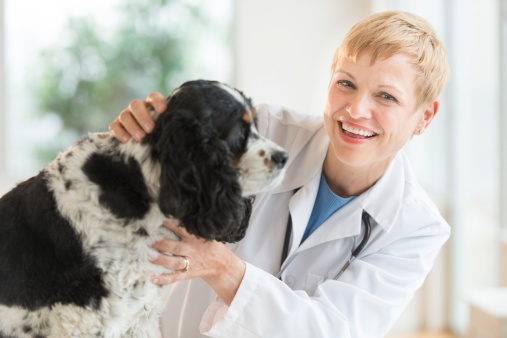 Thus far, dogs have successfully identified bladder, skin, lung, ovarian, breast, and prostate cancers. Since 2004, research has indicated that dogs might be able to sniff out cancer; however, it’s not definitively proven that they are always effective. In fact, there is an intense training process that only a small number of purebred dogs can complete, and not all studies have provided consistent results. Certain dogs—like purebred springer spaniels—do seem to be better able to sniff out cancer, which helps to lead researchers to new medical developments. If the team at the University of Pennsylvania is successful, the use of a dog’s sense of smell for medical research could revolutionize cancer detection and potentially save countless lives. It’s yet one more reason to love our canine friends. Krisch, J.A., “Training Dogs to Sniff Out Cancer,” The New York Times web site, September 10, 2014; http://well.blogs.nytimes.com/2014/09/10/training-dogs-to-sniff-out-cancer/?_php=true&_type=blogs&ref=health&_r=0. Willis, C., et al., “Olfactory detection of human bladder cancer by dogs: proof of principle study,” BMJ September 25, 2004; 329(7468): 712, doi: 10.1136/bmj.329.7468.712.